Print your logo onto these custom printed allura phone charging mouse mats or one of our other innovative office accessories and use them in your next marketing campaign as a unique giveaway item. 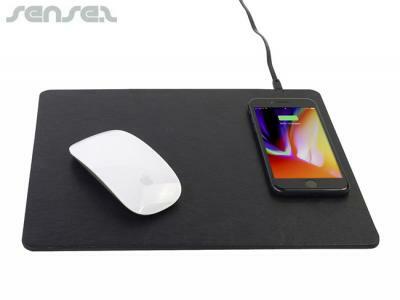 Allura Phone Charging Mouse Mat combines the functionality of a traditional mouse pad and the latest in wireless charging technology. Use your mouse and charge your phone all at the same time and on the same pad. Made from PU leather and incorporating protection security, Allura is the perfect desktop item. Simply connect the mouse pad to any 5 Volt (DC) power source and place your phone onto the stand to start charging. This will brighten up your staff and make the office feel more streamline and executive. Compatible with any smartphone meeting the Qi wireless charging standard (e.g. iPhone 8, iPhone X, Samsung S8). Includes micro USB charge cable. 4 x Colour Digital Print an extra $1 per item. Prices below include a 1 colour print in 1 position. Other innovative corporate gift ideas that could be suitable to create brand awareness include these cheap promotional Standard Mouse Mats - 3mm Rubber, quirky advertising gifts such as these Multi Function Mouse Mats or how about using one of our more bespoke custom made products such as these great quality QI Wireless Phone Charging Stands? 4 colour process print is like a photographic print, where you can see a lot of detail and shading as part of your design. When we print your promotional allura phone charging mouse mats in full colour process we usually do this as a digital print. The colour match is quite good but is never quite such a perfect PMS colour match as is achieved by silkscreen print. Personalise your allura phone charging mouse mats or custom design office accessories for your marketing campaign. How can these unique promotional allura phone charging mouse mats or our personalised office accessories fit in with your marketing strategy and help you maximise your brand exposure? Our custom made Allura Phone Charging Mouse Mats can be produced from a minimum quantity of 100 pieces. We can have your logo branded on these corporate Allura Phone Charging Mouse Mats. A setup fee of AU$160.00 will apply to make the film.